Last week we launched our call for nominations for our 2015-2017 Council. 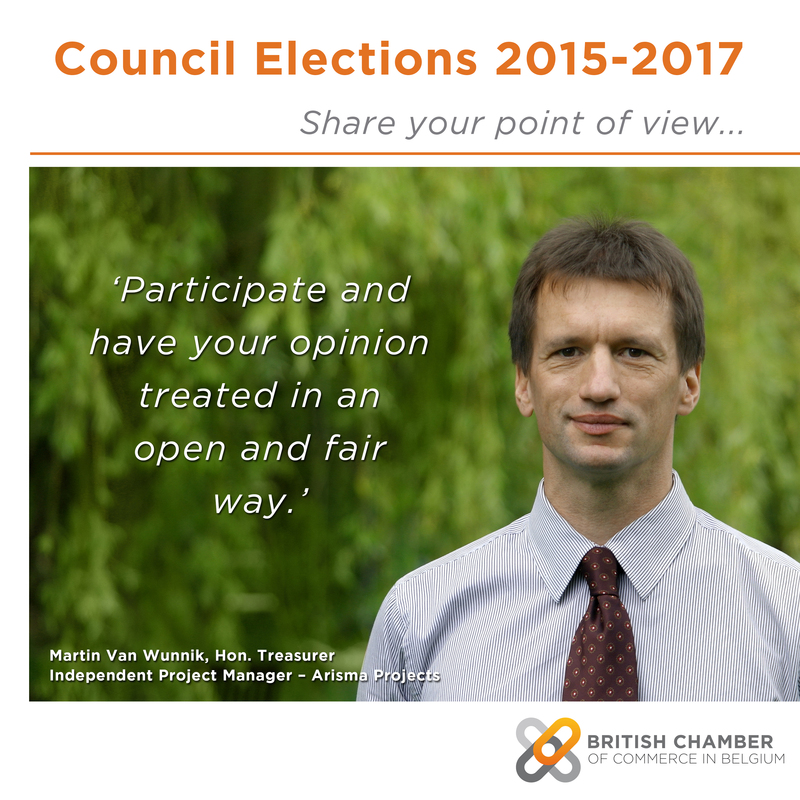 Martin van Wunnik, one of our newest members of Council, has kindly shared his thoughts about the importance of the British Chamber not only for his own business, but for his own personal development too. For more information on the Council nominations process and timeline, please follow this link. If you’re interested but want to know more about being a Council member, or standing for President, contact Glenn for an informal discussion. The first time I became associated with the chamber was when I worked as an employee for the major Belgian multinational dredging and construction company. Back then I used to go to the UK quite often for financial events, where I met Michel Vanhoonacker, the Chairman of the Belgian-Luxembourg Chamber in Great Britain. He introduced me to the British Chamber of Commerce in Belgium. So when I started my own company as an independent project manager in 2008, ARSIMA Projects, I decided to become a member. At first my purpose was to join an organisation that would allow me to be in touch through networking with multinational companies, as these could be interested in my services for projects related to finance and accountancy. Appreciating the British Chamber’s networking opportunities, the interesting events and activities, as well as the overall international and genuine atmosphere, I decided to become more actively involved. So, in 2013, when the position of Honorary Treasurer became available and the outgoing treasurer asked if I would like to fill the position. I was more than happy to apply. Working with and presenting the British Chamber bi-monthly and yearly figures (actuals, forecast, budgets) to different audiences was compelling for me. Furthermore, the interactions within the British Chamber team members, with its financial service providers and with the other members, Council, EXCO, patrons and regulars, give me great satisfaction and occasional business opportunities for my independent international project management services. The chamber is about delivering value to its members by organising events with policy makers, ambassadors, in great locations like the Embassy or the Residence. In my view, the chamber is a very good offer. I also occasionally attend chamber’s learning workshops, being open to learning new things or extend my existing knowledge, and the chamber is a good place to do that. These workshops allowed me to develop personally as well as professionally. Participate and have your opinion treated in an open and fair way.